This beautiful 1,432 sq.ft. home welcomes you the instant you enter it. The large U-shaped layout features stainless steel fridge, stove and built-in dishwasher, ample counter and cupboard space, ceiling fan, range hood fan and three large windows overlooking the front yard. It connects with and adjoins the dining room. The spacious living room over looks the front yard through picture windows. The front door provides access to an attached wood deck and patio area (ideal for hot tub). There are 3 bedrooms located on the main level with the master bedroom featuring his and her closets. A full bathroom is located central to the bedrooms. Main floor laundry and a half bathroom are located near the garage entrance. The lower level features a large recreation room and family room (currently used as fitness room) with bar and rustic country theme. The renovated three-piece bathroom features a large tiled walk-in shower. There is also a bedroom and office. A large unfinished storage room houses and provides access to the infrastructure. Features: high efficiency natural gas furnace, central air conditioner, natural gas hot water heater, rust buster water treatment system, and central vacuum with attachments. There is an attached single car garage currently used for storage. Steel cistern buried next to house collects rain water run off from house. Used to water yard and as a back up system for the house. Original well in 1972 not in use any more. 1)	balance of home quarter (NW 22-25-26-W3), total price $825,000. 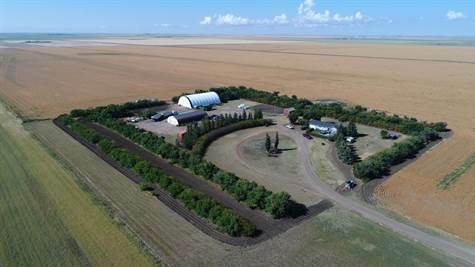 Farmland is currently rented to neighbor for 2019 crop year.